The most recent Quarterly Tourism Monitor report reveals insights about inbound travel to major destinations within the Asia Pacific region during the fourth quarter of 2018. International visitor arrivals (IVAs) into these 32 destinations have collectively reached a new record high. At 103.5 million, there is a growth rate of 7.4 percent and an increase of more than 7 million additional arrivals over the same period last year. Northeast Asia reported an impressive year-on-year growth of 12.8 percent, driven mainly by strong volume gains of IVAs into Korea (ROK), Hong Kong SAR, and Macao, China. This collectively added more than 4.6 million additional IVAs to the sub-regional total. Nepal outperformed its South Asian neighbours, showing a double-digit increase of 35.5 percent for the quarter. This was boosted by strong traffic from Sri Lanka and China. Indonesia and Vietnam led the percentage growth in Southeast Asia with solid increases of 14.4 percent and 11.7 percent respectively, whereas Malaysia witnessed a marginal decrease of one percent in this period. Following the catastrophic Typhoon Yutu in October 2018, the Northern Mariana Islands experienced nearly 60 percent decrease in visitor arrivals. Within the Pacific region, Palau also reported a significant fall in this quarter. This was mainly driven by a reduction of flights from China and the ensuing decline of Chinese arrivals (-64.9%). 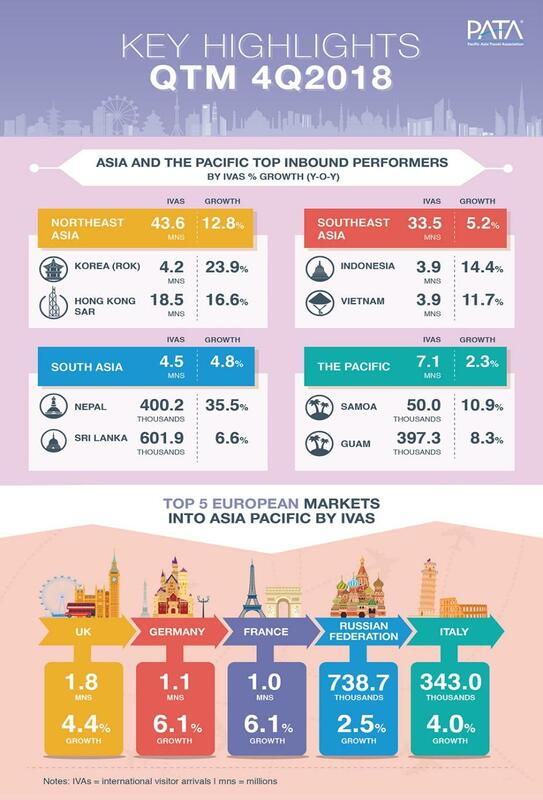 The top five European markets into Asia Pacific generated close to 5 million IVAs during this quarter with a 4.8 percent gain year-on-year. The United Kingdom and Germany were the major generators of arrivals, contributing more than one million foreign arrivals each into the region in this period. PATA Quarterly Tourism Monitor (QTM) provides a timely quantitative view of inbound travel for all major destinations in the Asia Pacific region. Each QTM report includes a comparative listing of Asia Pacific destination performances with visitor arrivals data by country of origin and percentage changes compared to the same quarter in the previous year.